Over the years we have come to love and appreciate one of the most classic quilt styles in the UK tradition – frame quilts. We’ve taught several classes together and individually featuring this style (one of Chris’s class samples is shown above) and we’ve also re-visited it in several of our series of Heritage Quilt patterns. What is so appealing about this style is its sheer versatility – it can be as simple or complicated as your time and skills allow. Lots of piecing, not very much piecing, co-ordinated fabrics or truly scrappy, perhaps throw in some appliqué, hand piece or machine piece or combine the two techniques – it will all work. 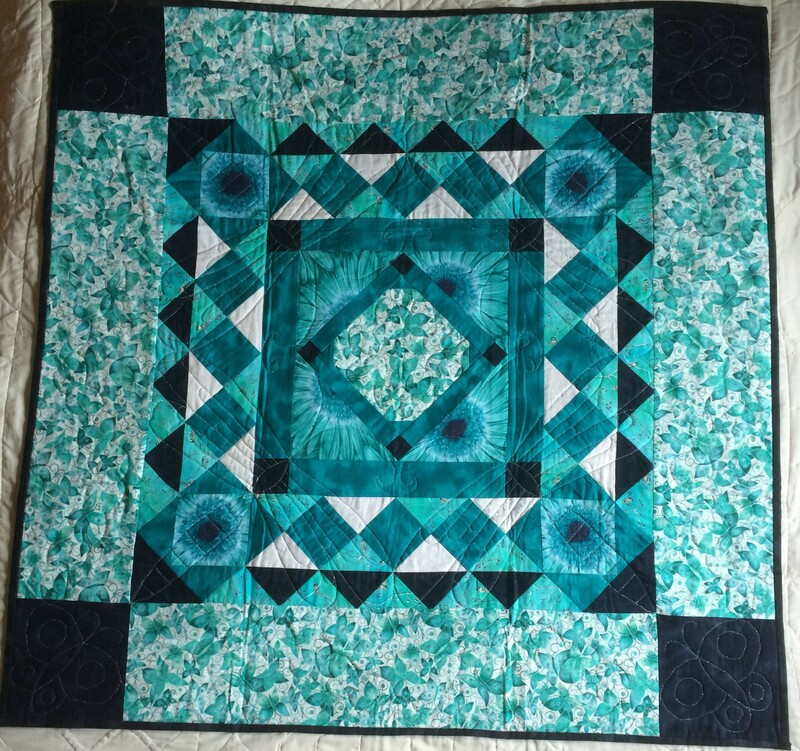 We’ve rounded up some examples to pique your interest and Barbara has gone so far as to start up a Frame Quilts board on her Pinterest account. 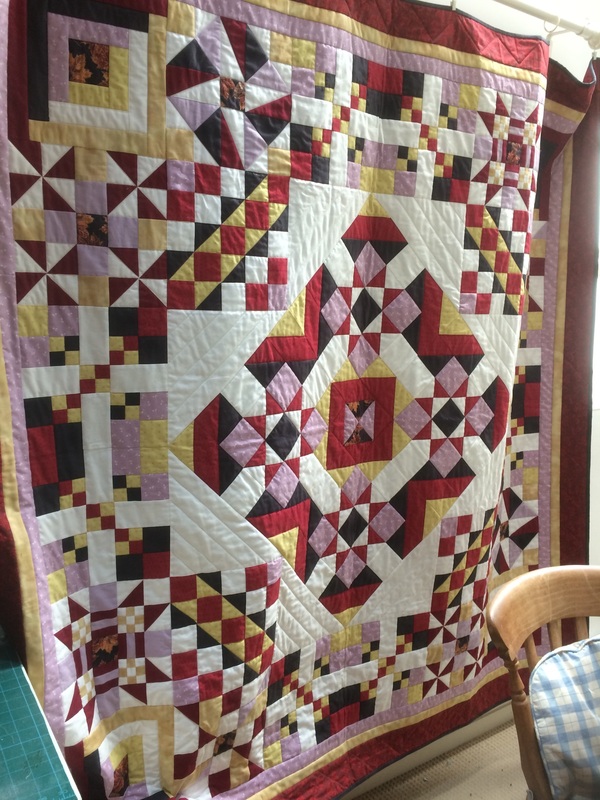 First, a vintage Welsh “everyday” frame quilt from the house collection of Jen Jones. Look how simple this is – and how stunning. 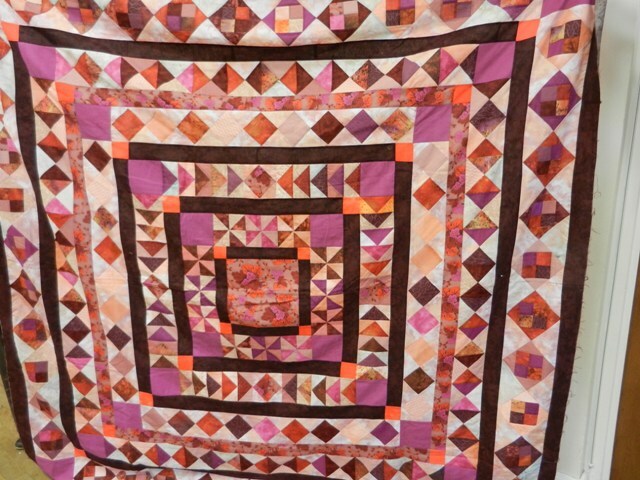 This is one of two frame quilts featured in Barbara’s classes at The Corner Patch this year. Below you can see Barbara’s re-make of the same quilt – quite a difference! We’re going to follow this pictorial post with Frame Quilts Part 2, coming soon to a screen near you – tips and guidance on how to go about constructing your own frame quilt. Stay tuned! Click here to download a colouring page based on this block so you can doodle your very own variation. Just a reminder that you can find us also on Instagram as @chrisfranses and @barbarachainey. Also check out the range of patterns and tutorials on Meadowside Designs. We seem to have reached the last month of this year in somewhat of a rush. There may be snowflakes falling across the blog pages but we haven’t yet managed to acquire much festive spirit. Barbara is packing up her desk at the Overseas Office ready to make a quick return to the Rural Office and Chris is hurtling around at C&B Towers putting the finishing touches to class plans, Web Wandering, class samples and other essentials. Breaking news of the gloomy sort is that our beloved HQ may soon be closing its doors so we are going to have do undertake extensive research to find a replacement. For more than 10 years it has been our preferred venue for coffee, lunches, executive meetings and general hideout – a very hard act to follow. Fingers crossed that it is one of those rumours that occasionally sweep through the town but turn out not to be that accurate. Our Electric Quilt doodles page has been updated – you can find a printable download for a colouring page here. Seasonal greetings and happy stitching to one and all. After what seemed like a never-ending winter followed by one of the longest summers we can remember our thoughts are now set on a busy autumn programme of classes and projects. At C&B Towers renovations to an adjacent property are a noisy disruption to the calm required for creativity (and gardening) – all staff have been given leave of absence so Chris is manning the fort (almost literally) armed with noise-cancelling headphones. Barbara has taken off, yet again, for the peace and quiet of the Overseas Office. Maybe what we really need is somewhere that would be a Not-Overseas-C&B Towers, with all the benefits of both locations and none of the drawbacks. Chris’s classes at The Corner Patch in Eccleshall begin this month, Barbara’s classes are scheduled for October. Samples and worksheets are being put together even as this page goes to press, new EQ doodles are posted on our Doodles page (you can download a colouring sheet here) and notebooks and lists are being consulted. It really feels like autumn!! A Star Sampler from EQ, recently “discovered” in Barbara’s files. Fabrics might be being selected at this very moment…… just when another project is the last thing you need! Chris’s next Block of the Month – starting next week – at The Corner Patch is on display on the shop wall Remember Chris’s regular Wandering the Web feature in P&Q magazine, also take a look at the UKQU website and Facebook presence. Happy stitching!